I was in Bratislava earlier today as part of the Free Market Road Show, where I spoke about how European nations are in trouble because of excessive spending and aging populations. But I’m not going to write about my presentation because Peter Gonda of the Konservatívny Inštitút M.R. Stefánika shared some data on the post-World War II economic performance of Czechoslovakia that is far more interesting. As you can see from his chart (the English title would be “The Economic Reality of Socialism”), Czechoslovakia, West Germany, Austria, and Finland all had very similar levels of income in 1948. 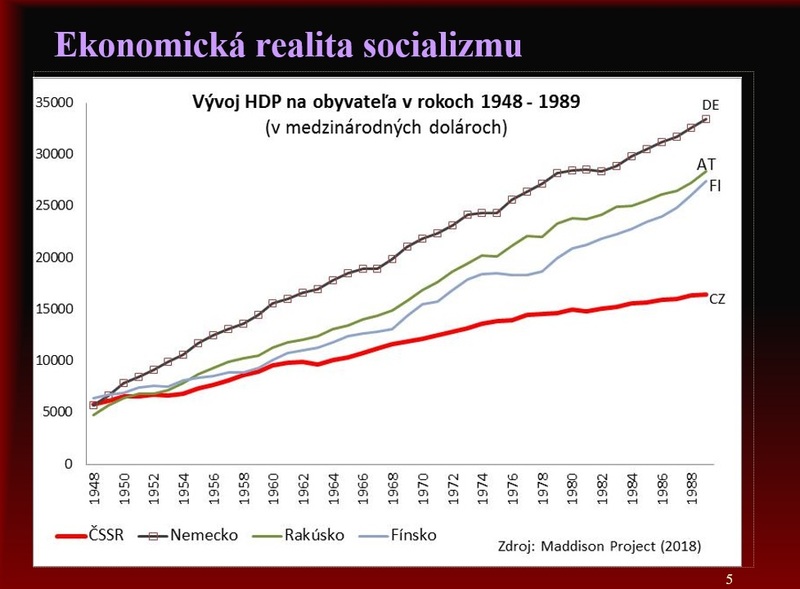 But over the next 40 years, the socialist Czechoslovakian economy (CZ) fell further and further behind the market-oriented economies of those other countries. Indeed, after just four decades, the market-oriented nations averaged twice as much per-capita economic output at the beleaguered Czechoslovakian economy. By the way, things have improved since the collapse of communism. Czechoslovakia in the early 1990s peacefully split into two nations, the Czech Republic and Slovakia. And both of them have since adopted a decent amount of pro-market reforms and have begun to converge with Western Europe. So our story has a semi-happy ending (though I wrote last year that I’m worried about Slovakia backsliding a bit). P.S. If you want other compelling examples that show – over multiple decades – the superior performance of market-oriented nations, click here and here. P.P.S. Under Soviet rule, Czechoslovakia was genuine socialism (i.e., government ownership, central planning, price controls), which obviously is more damaging than what many people think of today as socialism (i.e., punitive taxes and a big welfare state). P.P.P.S. Ludwig Erhard deserves much credit for West Germany’s post-war recovery. This is sad, but I hope the country will economicaly and mentally recover from damage done by socialist. 1. The day the Russians left, everyone changed their second language in school from Russian to English. So if we wanted directions, he suggested we ask someone under the age of … and they will speak pretty perfect English. 2. The Slovakians immediately became capitalists, however, with no capital. The Russians had stripped the country of all wealth. If they had a great idea for a business (teaching English was one) there was no one to finance them. We have a huge advantage over other countries, in that if you have a good idea, there are all sorts of avenues for finance.